A busy weekend in May. 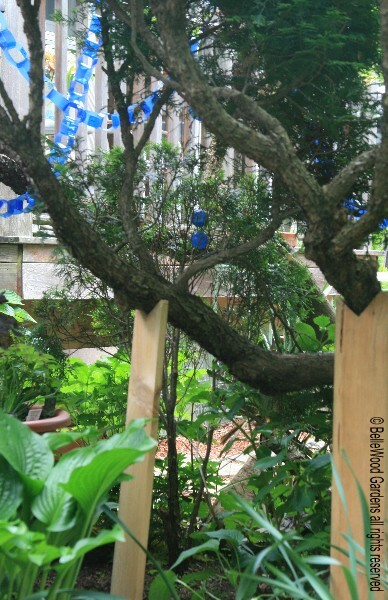 Yesterday was Earthly Delights, the huge multi-vendor plant sale and estate tour. And today is a garden visit and potluck luncheon of the Watnong Chapter of the North American Rock Garden Society. 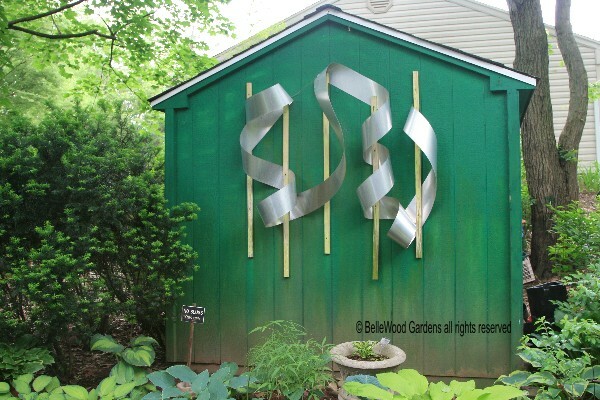 This year it is at Maison du Hosta, a member's garden in Piscataway, New Jersey. 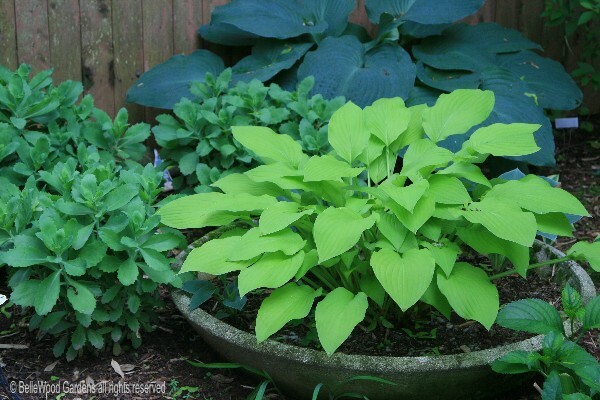 A double size corner lot filled with more hosta than you'd think was possible. The weather is completely overcast, with a spatter of heavy mist or light rain. No matter, off we go with some orange custard for the pot luck luncheon and some nicely potted Hemerocallis 'Kwanso Variegated', a white variegated day lily with double orange flowers for the plant sale. 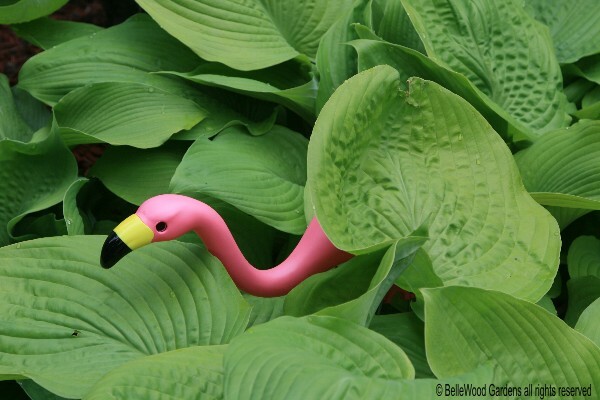 Upon entering the garden we're welcomed by a small flock of flamingos lurking in the hostas. 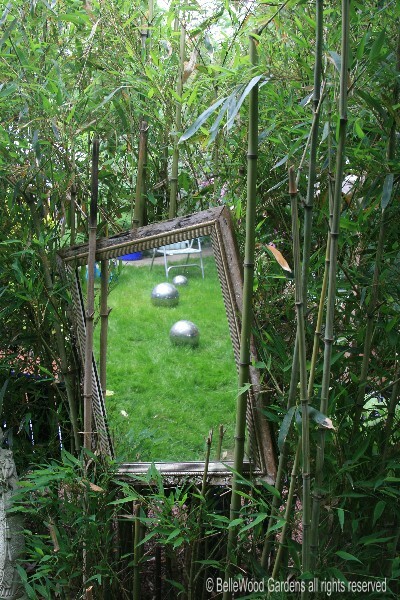 It's an interesting garden filled with all sorts of objects along with the hostas. calls "Homage to Frank Gehry", a sinuous sprawl of aluminum flashing. of various sizes gleaming on the vividly green lawn. I like this. 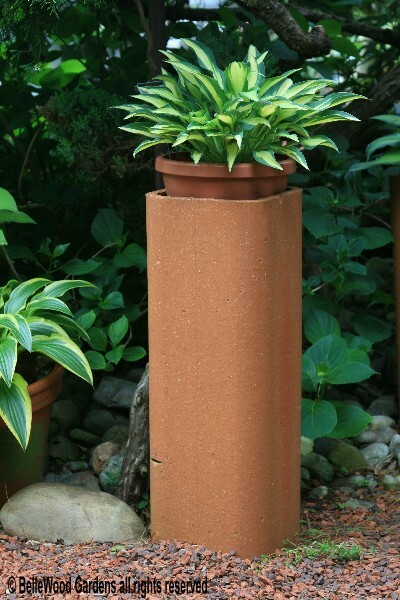 Hostas in the ground, hostas in pots, hostas elevated in a drain tile. 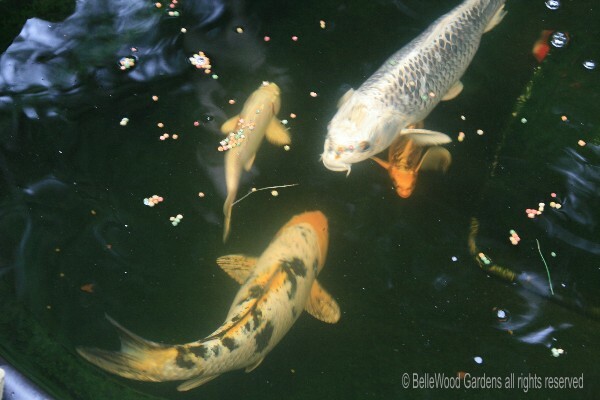 With a scattering of fish food the koi are enticed to the surface. Some have been here for 8 years. Others arrived last month. A pool heater means they live outdoors in the garden year-round. soon be embellished, painted in some eye-catching color. You think?